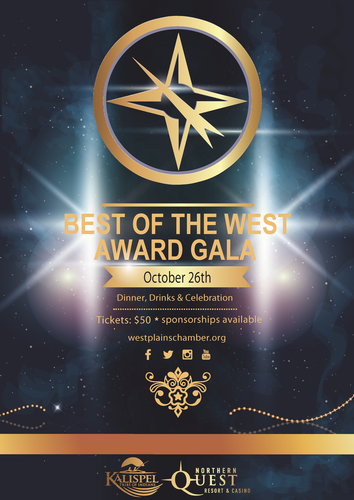 Our Annual Best of the West Awards Gala honors outstanding leaders, businesses, organizations, educators, military personnel, and first responders in the West Plains. The Best of the West is our chance to really shine the spotlight on those who consistently go out of their way to go above and beyond to make the West Plains and the West Plains Business Community a better place. The attire for this event is "Dress to Impress"
This year, we are going to recognize outstanding members from the following categories. A West Plains Chamber Member business with 10 or fewer employees and demonstrates one or more of the Business of the Year characteristics listed above. A West Plains Chamber Member business employing at least 11 and fewer than 35 employees while demonstrating one or more of the Business of the Year characteristics listed above. A West Plains Chamber Member business employing 36 or more while demonstrating one or more of the Business of the Year characteristics listed above. Recognizes and celebrates those who serve not only our area but our country and at the same time making the West Plains a better place. Celebrates a professional educator from a K-12 environment who opens student minds and expands the realm of the possible for the next generation of local and world leaders. The Young Leader of the Year Award recognizes an up and coming leader for their exceptional efforts to serve and enhance their place of business, or community and the overall West Plains. Celebrates the extraordinary accomplishments of a West Plains Chamber Member and their impact on overall business environment. The program begins at 6:30 p.m.